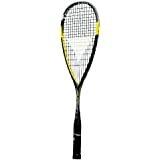 The Carboflex 125 S is the competition racquet played by Mohamed El Shorbagy- World Number 1! The shaft's flex benefits provide a more appropriate racquet suited to today's skillful touch player: powerful, fast and responsive. Additionally, the Custom Fit Bumper allows players to detach the bumper in order to allow for a more head-light balance for even more swing speed. The Carboflex S 125 is designed for the modern player who needs speed for winning points in a short time frame. 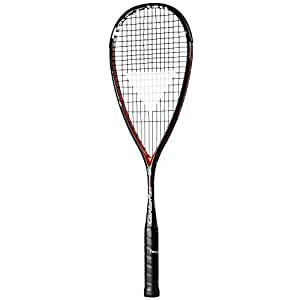 Web Description: Tecnifibre Carboflex 125 S Sport: Squash Headsize: 500 cm sq. Length: 27" Beam Width: 18mm Weight Strung: 135g/(4.7 oz.) Color(s): Black/Red/White Composition/Construction: Graphite/Basaltex Multiaxial String Pattern(Mains X Crosses): 14 x 18 Recommended String Tension: 20-30 lbs. Balance: 35cm/(13.8 in.) Stiffness/Flex: 82 RA Grommet Technology: Custom Fit Bumper Frame Technology: ISO Sharp Design Swing Weight: 187 kgcm Manuf. Recommended String: 305+ NOTE: PO box deliveries are not available. The item can't be shipped to AF, AA, AC, AE, AM, AP in the Unite States. 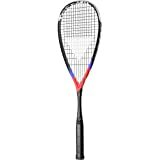 I had been using Harrow Vapours for a few years and was reasonably happy, but I was looking for a racket that could help me take my game to the next level and so I took a chance and bought the Carboflex 125S being unable to try it out beforehand. Let me say I was very disappointed initially, I felt the control that I had was not there with this racket. 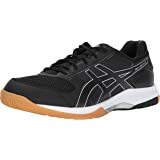 I play on a very warm court and I was hitting the ball loose and there was too much power. However, I figured the factory tension of 26-28lbs may have been the issue. Sure enough, I switched over to the Tecnifibre 305 1.1mm at 29lbs and my trusted green string and higher tension made all the difference. I am now able to hit the ball tight, and as a big hitter, still have the power reserves to really hit the ball at pace as well. I hope this encourages anyone who is currently not happy with the racket to try a different string/ tension before giving up on it. For those with the Harrow Vapour, the Carboflex racket is lighter in the head but I would say it felt evenly balanced. The Carboflex 125S is definitely more maneuverable and I am able to play more delicate shots at stretch. My final verdict is that I highly recommend the Carboflex 125S strung with Tecnifibre 305 1.1 green string. I'll be quite a downer by telling you this is my 2nd best choice. My 1st choice would have been the Harrow Vibe, which I've got 1 out of 4 left, but given that I'm not a sponsored pro player, I can't keep replacing them every time they crack because I sneezed loudly. I love them, but they are VERY fragile. I now love them. Sturdy and unforgiving if you don't prepare your swing (this actually helped me develop my game), very powerful. The shaft is a little thick and bothered me, and I did feel it head heavy when compared to the Harrow Vibe, but I got used to it after two games. The original strings are good but a tad tight, but the tension is a matter of taste. This is my weapon now. Proud of it. 4.0 out of 5 starsGreat racquet, absolutely garbage stock strings. In short, loved the racquet for the 8 minutes the stock strings lasted - it didn't even make it to the end of warm-up. Very unimpressed. The racquet is gorgeous, feels solid, slightly head heavy but overall quite balanced, and felt like something I'd like. 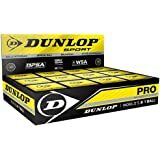 I'm coming from Dunlop Jonathan Power Hotmelts (whose strong strings lasted 2+ years..) and felt this gave a bit more feedback and felt 'lively', but not excessively so. The stock grip felt great actually, but I opted to rip it off for a SUPER-PU - slightly more tack and cushion. The stock strings look like 18 gauge 'DNAMAX' from technifibre and judging from the ping sound on-hit, the tension was inappropriately high - this is an oversight on the part of Technifibre and I will be contacting them for a fresh set of strings. The break was a clean cut through the string right at the edge of the racket, lined up with the sweet spot, so either a design flaw with the grommets, rubbish string, or moronically high tension - or all 3. I'll be slapping some Ashaway strings on this at lower tension and trying again, unless Technifibre opts to send replacement strings, and returning the racquet if a similar break occurs. 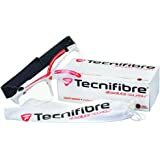 Technifibre, if you're reading this, review your stock stringing tension and string quality. This is unacceptable for a high end racquet, especially from a company that makes string. First thing I would like to say is that I play very good squash but I am not a pro world class squash athlete. I have been using the wilson n120 n code series which weighs 120g since I started university in 2004 and did not change it since i bought this racquet. After extensive research i was scared to try this out but i have to say it felt different during my first game but I automatically got used to it in one week and i absolutely adore this now. Perfect for a good technical and a powerful player! Go for it dont think twice about it!! My son is stunned by how much power and control he gets from such a light racket. Furthermore, you probably don't need to rush out to get new strings - the factory strung ones are fine after you play with them once. Thumbs way up on this one! There is one thing to note, though. The only difference between the 125S and the older 125 is the skinning and the bumper. I wouldn't spend more money on this one until your old racket breaks. (Sorry, Tecnifibre.) All in all, though, the 125S is a fantastic choice!